When my oldest son was in eighth grade, his graduating class went to Israel for two weeks at the end of the year. When he came back, he told me about the first stop on his itinerary. “Mom,” he said excitedly on the ride home from the airport. “The first thing we did when I got to Israel was plant trees at some place called Neot something.” He knows I’ve always wanted to plant trees in Israel. One of my most vivid grade school memories is collecting quarters to fill up Jewish National Fund cards to plant trees in Israel. You remember them, right? Large, green slotted cardboards with pictures of leafy trees all over the outside. We got them about a month or so before Tu B’shvat, the Jewish New Year for trees. I remember only wanting shiny, new quarters for my cards. We grow up taking trees for granted in America, but not in Israel, as every Hebrew teacher I ever had explained to us. I collected quarters like a Girl Scout selling boxes of cookies. I didn’t stop until I filled every card in my posession. When my son said he planted trees, I was so excited. “Neot what” ? I said, but I knew he had no idea where planted trees. I scanned the first page of his battered two-week itinerary and found it. Neot Kedumim: 625-acre Biblical landscape reserve. I found out that the name Neot Kedumim means oasis of antiquity. The reserve, which is off the beaten path and probably why I’d never heard of it, is half way between Jerusalam and Tel Aviv outside the city of Modein on Route 443. The country’s biblical landscape is restored here to help visitors visualize all the plants and vegetation mentioned in the Bible. Ancient terraces, wine and oil presses have been restored, and thousands of trees and shrubs have been planted. 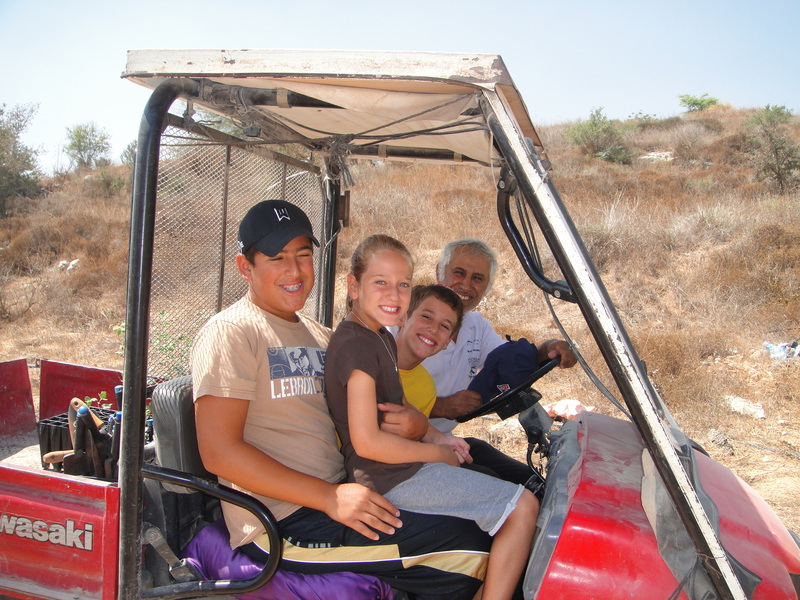 That summer, our family spent our second summer in Israel, and Neot Kedumim was first on our list. I called the number and was told what day to come and where to wait for Zechariah, the person who would meet my family at the gate with as many seedlings as we wanted. 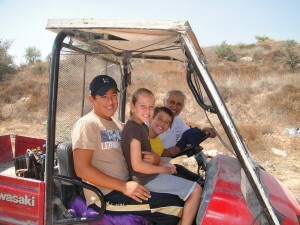 Sure enough, a few minutes after we pulled into the gate, an elderly, Yemenite man pulled up next to us and invited my kids to ride beside him in his little red tractor. In the back, was a flatbed full of tiny trees just waiting to be planted. We spread out in a field while Zechariah showed my children how to remove the seedlings from their plastic pots and put them carefully into the soil. It was very hot outside, but no one cared. All I could see were my kids’ happy expressions beaming like the sun directly above their heads. We were on a sacred mission. That year, two of my youngest son’s close friends lost their fathers. I also lost a friend. As soon as I knew we were going to spend a second summer in Israel, I knew I wanted to plant trees in their memory. I told my son to think about his friends and about the good times they had together with their dads and I thought about my friend, as young as some of the trees in the forest. Did you know there’s a prayer for planting trees in Israel? I had no idea until I saw a copy of one in the gift shop at the reserve. Amen for all the trees, I thought to myself, now and in the future; and Amen for our children. Sun-Thurs, 8:30 – 4, Fri, and before Jewish holidays 8:30 – 1.